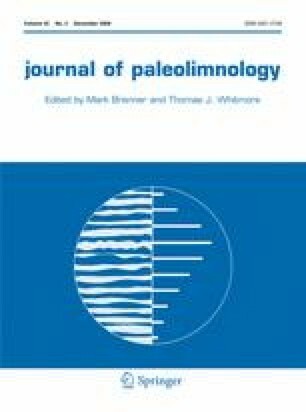 The biostratigraphy of fossil diatoms contributes important chronologic, paleolimnologic, and paleoclimatic information from Lake Baikal in southeastern Siberia. Diatoms are the dominant and best preserved microfossils in the sediments, and distinctive assemblages and species provide inter-core correlations throughout the basin at millennial to centennial scales, in both high and low sedimentation-rate environments. Distributions of unique species, once dated by radiocarbon, allow diatoms to be used as dating tools for the Holocene history of the lake. Diatom, pollen, and organic geochemical records from site 305, at the foot of the Selenga Delta, provide a history of paleolimnologic and paleoclimatic changes from the late glacial (15 ka) through the Holocene. Before 14 ka diatoms were very rare, probably because excessive turbidity from glacial meltwater entering the lake impeded productivity. Between 14 and 12 ka, lake productivity increased, perhaps as strong winds promoted deep mixing and nutrient regeneration. Pollen evidence suggests a cold shrub — steppe landscape dominated the central Baikal depression at this time. As summer insolation increased, conifers replaced steppe taxa, but diatom productivity declined between 11 and 9 ka perhaps as a result of increased summer turbidity resulting from violent storm runoff entering the lake via short, steep drainages. After 8 ka, drier, but more continental climates prevailed, and the modern diatom flora of Lake Baikal came to prominence. On Academician Ridge, a site of slow sedimentation rates, Holocene diatom assemblages at the top of 10-m cores reappear at deeper levels suggesting that such cores record at least two previous interglacial (or interstadial?) periods. Nevertheless, distinctive species that developed prior to the last glacial period indicate that the dynamics of nutrient cycling in Baikal and the responsible regional climatic environments were not entirely analogous to Holocene conditions. During glacial periods, the deep basin sediments of Lake Baikal are dominated by rapidly deposited clastics entering from large rivers with possibly glaciated headwaters. On the sublacustrine Academician Ridge (depth = 300 m), however, detailed analysis of the diatom biostratigraphy indicates that diastems (hiatuses of minor duration) and (or) highly variable rates of accumulation complicate paleolimnologic and paleoclimatic reconstructions from these records.